Subtle stripes for adding depth. 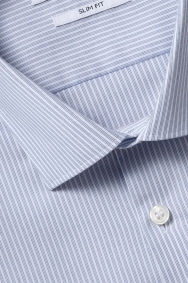 This shirt will add an extra dimension to your suits without taking over thanks to its fine striped pattern. The blue tone is understated enough to pair with any suit making it a versatile choice, and it’s made from 100% cotton so it will stand the test of time. Cut in a slim fit, it sits close to your frame for sharpness. 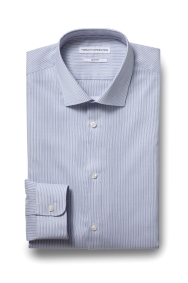 Match this shirt’s cut with a slim fit suit in any shade.